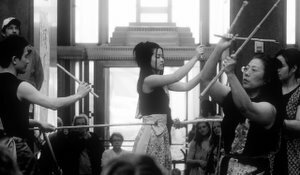 Here are press quotes from Piao Zhu 飄竹: Flying Bamboo, a two-and-a-half hour musical ceremony created for the Seattle Asian Art Museum in response to the Capitol Hill shooting. Byron Au Yong brings forth another new performance piece entitled “Flying Bamboo - Piao Zhu” for the Seattle Asian Art Museum on May 6. Inspired by the Seven Sages of the Bamboo Grove – a group of scholars and poets who got together to escape politics and societal duress in days of old – this performance is the composer’s own 21st century meditation that reflects on the horror and beauty of bending amidst turmoil like bamboo in a storm. Costumes by Michelle Kumata. Performers include Au Yong, Karen Akada, Kelsey Furuta and Karen Lindenberg. Piao Zhu: in English, “flying bamboo,” the name for a new dance/percussion/chant meditation/ritual by Byron Au Yong, a composer whose multimedia works are as exquisite and imaginative as they are unclassifiable.